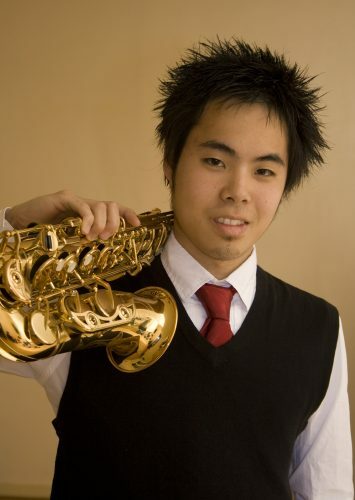 Born in Medicine Hat, Alberta, Michael Morimoto started his musical studies in piano, later switching to the saxophone. He started his saxophone studies at the Medicine Hat Conservatory of Music and Dance with Lyle Rebbeck. Michael received his Master of Music from University of British Columbia studying with Julia Nolan. He finished his studies at the Conservatoire de Cergy-Pontoise with Jean-Yves Fourmeau receiving the Medaille D’or by a unanimous decision of the jury. He also studied at the Conservatory de Versailles with Vincent David in 2011-12 and with Marie-Bernadette Charrier at the Conservatoire de Bordeaux in 2009-10. Michael completed his bachelor of music, performance degree at the University of Alberta under the instruction of William Street and Po-Yuan Ku. In 2006, he placed 2nd in the University of Alberta Academy Strings Competition, in 2007, he placed 3rd at the National Music Festival of Canada, 1st in the University of Alberta Wind Ensemble Concerto Competition, in 2008, he placed 1st in the University of Alberta Symphony Orchestra Concerto Competition, in 2009, he placed 1st at the National Music Festival of Canada and in 2013, he placed 1st in the University of British Columbia Concerto Competition, he was a semifinalist in the 2014 North American Saxophone Alliance Solo Competition and in 2016, he was a semifinalist of the CMC Stepping Stones Competition. Michael has been featured as a soloist in many ensembles including the University of Alberta Symphonic Wind Ensemble, University of Alberta Saxophone Ensemble, University of Alberta Symphony Orchestra, and the University of British Columbia Symphony Orchestra. He is also a member of the Proteus Saxophone Quartet, comprised of four Canadians who met while living and studying in Paris, aiming to promote and perform new commissions in contemporary music.